Here is how it works these days: You start hearing about a big, national problem and then it becomes a drumbeat. First there are a few articles and columns mentioning that such-and-such is a problem. Then a number of articles appear, then a “study” from a “think tank” confirms the problem and sounds the alarm about how terrible it is, and then just as the issue seems to be the only thing you are hearing about a solution is presented. Of course, the solution always involves taking something away from you and giving it to some company or industry standing in front of a billionaire or three. The right question to start asking when you hear about these “problems” is which billionaire is driving this. Here are five-plus examples of billionaires who use their money to try to get us to think what they want us to think in order to enact a right-wing economic agenda. 1) Pete Peterson’s deficit/debt scare campaign and his ongoing effort to gut Social Security and other entitlements.Leading every list of billionaires pushing an issue is billionaire Pete Peterson and his forever war on government doing things to make our lives better, especially Social Security. Peterson leads the list because of reports of his pledge to spend $1 billion on his pet issue. Have you ever heard anywhere that the budget deficit and national debt are a problem? 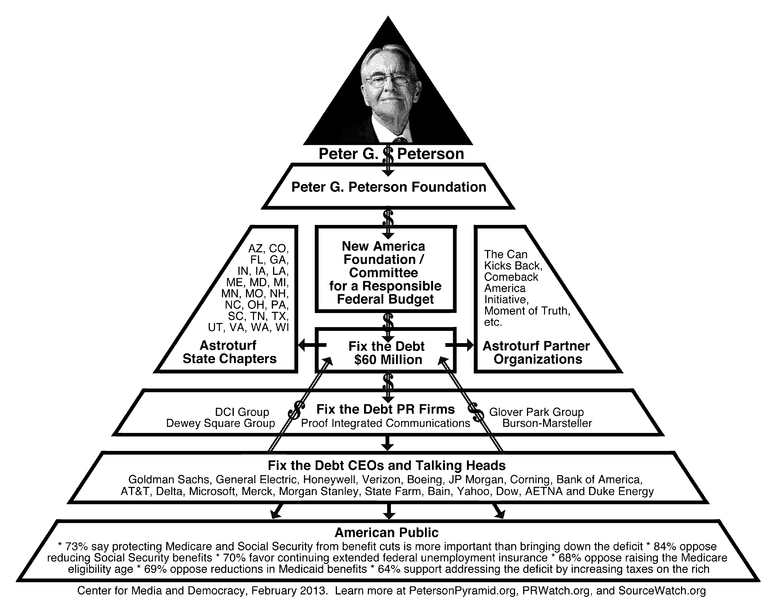 You can’t pick up a newspaper or magazine, turn on the radio or TV, or listen to any politician from the so-called “center” to the far right without hearing that, and the reason is Pete Peterson and his money. Last week one of Peterson’s deficit-scare groups was in the news. The Can Kicks Back is an organization named after the narrative that not cutting Social Security is just kicking the debt can down the road. They claim this is because there is a generational war where older people are living high on the hog and younger people will have to pay for this. The group tries to make legislators think younger people want them to cut Social Security, etc. using Astroturf videos, Twitter posts, etc. Well, the Peterson spigot seems to have dried up. The anti-debt group is… wait for it… in debt. All of that Astroturf hype about younger people demanding Social Security cuts? When the Peterson money ran out, the urgency went away. Meanwhile the country’s real deficit problem is our trade deficit, especially with China. The trade deficit is the measure of jobs and factories moving out of the country. Fixing this deficit just happens to create jobs, lift wages and repair our economy. If you are hearing about how terrible the budget deficit is and how it is so important that we all make sacrifices in order to bring that deficit down, it’s Pete Peterson ‘s money talking. Too bad there is no billionaire pushing us to fix the trade deficit. 2) Billionaire John D. Arnold’s attack on public-employee pensions. Have you heard that the biggest problem facing our states, counties and cities is the bloated, lavish, insane level of money that goes to public-employee pensions? Of course you have, and that’s partly thanks to billionaire John Arnold. Arnold got his start at Enron trading natural gas derivatives. After Enron he used his Enron money to form an energy-trading hedge fund. Now he is using his fortune to fund various philanthropic causes, including helping to keep Head Start running when Republicans recently shut down the government. Unfortunately he has also dedicated part of his fortune to gutting public-employee pensions. The Pew Charitable Trusts and the Laura and John Arnold Foundation are working together in states across the country to focus the debate over pensions primarily on slashing retiree benefits rather than on raising public revenues. Note that Arnold allies are pushing a ballot initiative in California to gut public-employee pensions. Of course, getting these things enacted often runs up against a troublesome problem: democracy. There are still places where voters have enough of a say to block some of the things the billionaires are demanding. But never fear, there are a few billionaires working on fixing that pesky democracy problem, too. 3) Charles Munger Jr. (near-billionaire and son of a billionaire)bankrolled California’s Proposition 20 in 2010 to create a “citizens redistricting committee” that took the process of drawing political districts out of the hands of California’s politicians. Munger and many Republicans believed this would immediately turn the state over to the Republicans because the districts were “gerrymandered”—rigged—to have a majority of “safe” Democratic-voting districts. It turns out that fair redistricting is a gift to citizen control and democracy. After the citizens commission got rid of the gerrymander, voters kicked out enough Republicans to give Democrats two-thirds control. Prop 30 increased taxes on the wealthy, while also bumping up the sales tax. Now the state has a budget surplus, schools are starting to get re-funded, infrastructure is starting to get repaired and things are getting done again. Other Munger-financed propositions include Proposition 32, a failed attempt to keep unions from being involved in politics and Proposition 14, which passed and gave California an “open primary” which keeps political parties from being able to choose their own candidates—instead the top two vote-getters in the primary go into the general election regardless of party. “The nation’s growing gap between the rich and poor has become a full-blown crisis, with the top 1 percent of families experienced a 278 percent increase in their real after-tax income from 1979 to 2007, while families in the middle 60 percent saw an increase of less than 40 percent. A large body of research suggests that high inequality leads to lower levels of representative democracy and a higher probability of revolution, as poorer citizens become convinced that the government is only serving and representing the interests of the rich. 5+) Silicon Valley billionaires Steve Jobs, Eric Schmidt and otherspushing low wages for people who work for them. Speaking of Silicon Valley billionaires…did you think billionaires were in favor of “free markets” and such? Well, it turns out not so much. In one (more) example of billionaires rigging the free market for their own gain, a lawsuit alleges that the top executives of Apple, Google, Intel, LucasFilm, Pixar, Adobe and others conspired to set up a scheme to drive down the pay of executives, engineers and others. The class-action lawsuit was filed on behalf of more than 100,000 employees and claims that around $9 billion was stolen from these employees in the 2000s. eBay and Intuit are involved in a similar suit. See Pando’s The Techtopus: How Silicon Valley’s most celebrated CEOs conspired to drive down 100,000 tech engineers’ wages. This article originally appeared at AlterNet.